This wedding party had a lot of fun with their custom wedding gear! 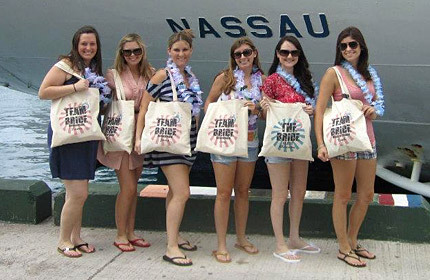 Bride Alexandra customized each girl a Team Bride custom tote bag for a cruise. Each bag included the wedding date and the girl’s name. 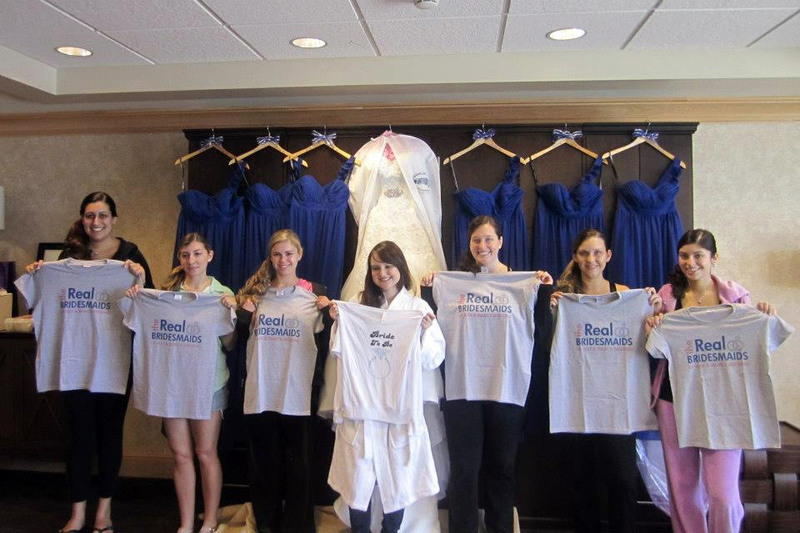 The girls also customized The Real Bridesmaids t-shirts for all of the bridesmaids and a Bride to Be t-shirt for Alexandra. Do you have photos to share? 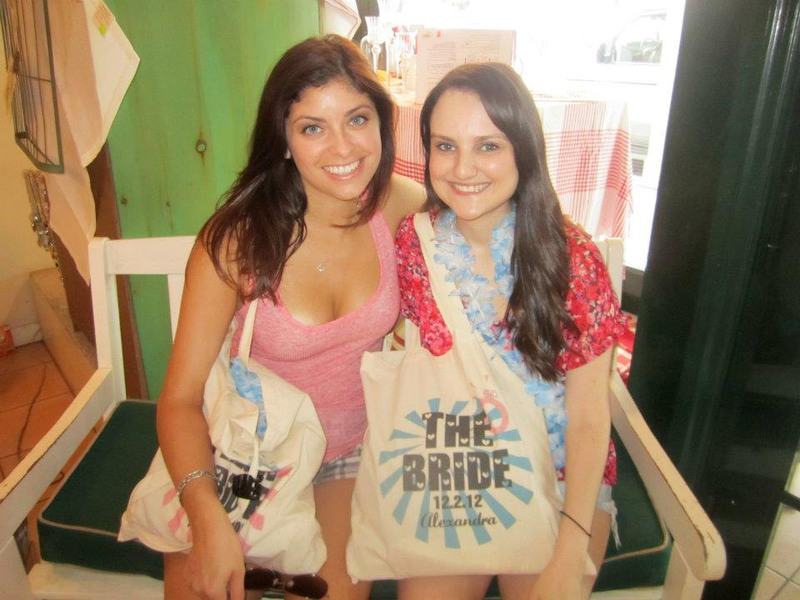 Send them to bridalpartytees@eretailing.com! If you’re having a unique bachelorette party, then you’re going to want custom shirts that match your theme. At Bridal Party Tees, we have tons of art in our library, so you’re sure to find something that’s perfect for your event! 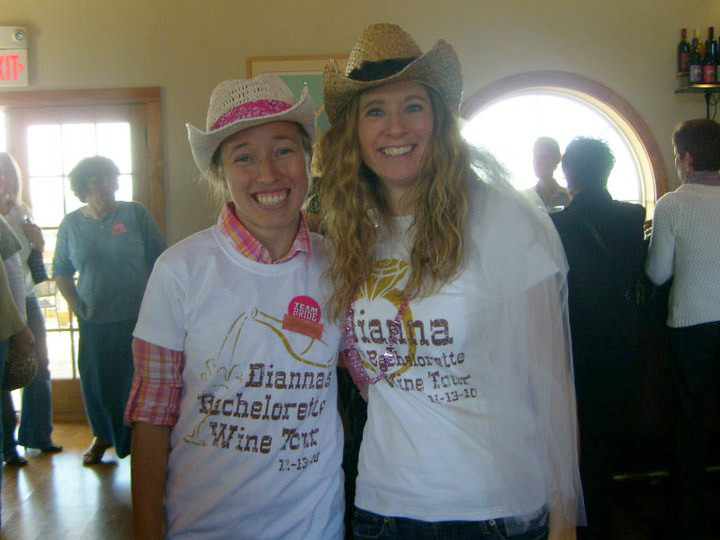 A wine tasting bachelorette party is a lot more low key than a crazy night of bar hopping! 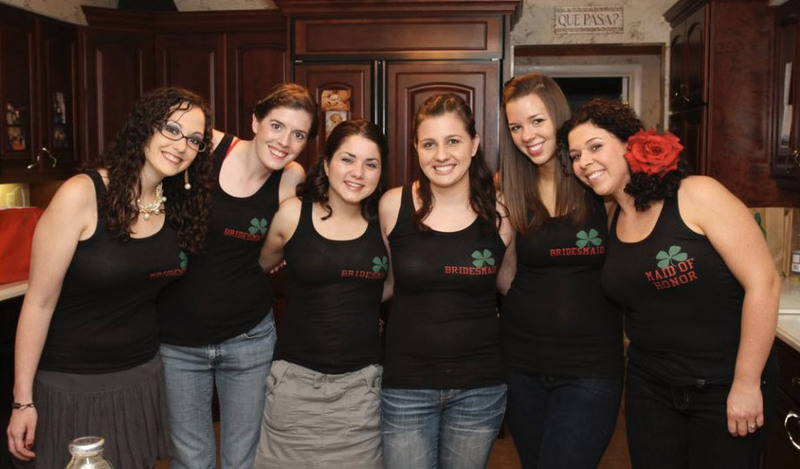 A holiday, such as St. Patricks’s Day, is the perfect thing to plan your party around. 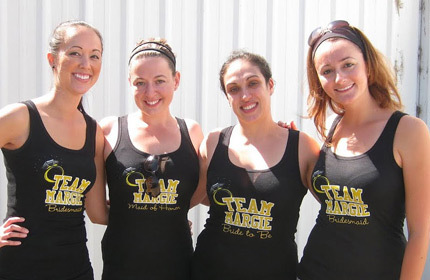 Pole dancing bachelorette parties are a great way to cut loose before the big day! Trying something new, such as sky diving, is a definite way to have an experience that you will never forget! 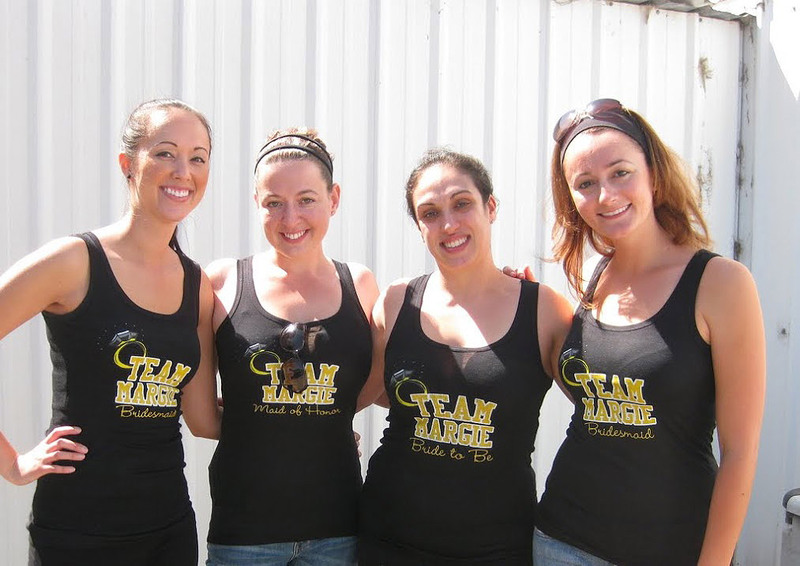 Taking one of our Team Bride tank tops and customizing the back makes for a great keepsake of the event! 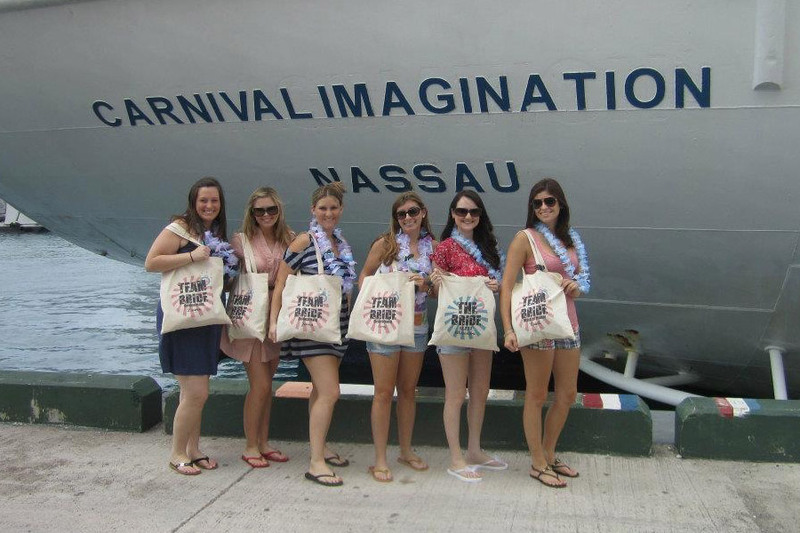 What are you doing for your bachelorette party? Whatever you do, you should check out our collection of customized t-shirts for a fun way to celebrate! BPT Group Shots: Team PB&J! This group shot was sent to us by Jenna! Jenna was a bridesmaid for her friend Valarie’s wedding and they ordered these shirts to wear for Valerie’s bachelorette party weekend in Baltimore. Valarie and Jenna had gone to a Beyoncé concert and were inspired by her song “Single Ladies.” Since they are all big fans of Beyonce and the song, they thought it would be fun to incorporate the song lyrics into their designs! All the bridesmaids shirts read, “Put A Ring On It!” followed by “Valarie’s Bachelorette Party” and then the jeweled ring embellishment. Valarie, the bride, had a shirt that read, “Jared Put A Ring On It!” followed by the date of their wedding 5-22-2010. Jared is of course the lucky groom! The girls wore the shirts as they visited Baltimore and even took a pole dancing class! Woo-Hoo, looks fun! Thanks Jenna!